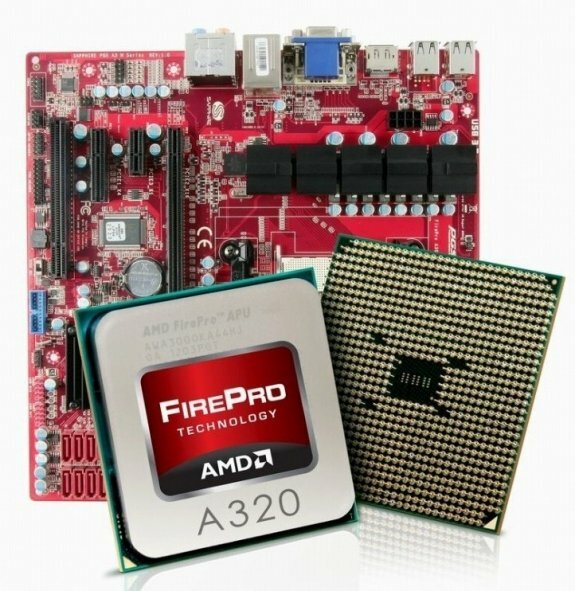 TechPowerUp reports AMD's FirePro APUs and motherboards are now available in Japan, it includes the quad-core FirePro A300 (3.4GHz, 4GHz Turbo, 760MHz GPU, 65W TP) and the quad-core FirePro A320 (3.8GHz, 4.2GHz, 800MHz GPU, 100W TDP). The AMD reference design motherboard has a Micro-ATX form factor, it's manufactured by PC Partner. The motherboard features socket FM2, powered by an 8-phase digital PWM power supply to the APU socket, four DDR3 DIMM slots supporting 64 GB of dual-channel DDR3-1866 MHz memory, expansion slots that include PCI-Express 2.0 x16, PCI-Express 2.0 x4, x1, and legacy PCI; eight SATA 6 Gb/s ports, display outputs that include dual-link DVI, dual-link DisplayPort, and D-Sub. HD audio and gigabit Ethernet make for the rest of it.